For anyone into horsepower and speed, Jim Feuling’s workshop in Ventura, north of Los Angeles, is a magical place to be – the petrolhead’s equivalent of Willy Wonka’s factory for a chocoholic. Shelves are piled high with tuned V8 engines and special cylinder heads. The walls are papered with dyno charts, magazine cuttings and many of the 100-plus patent certificates the 56-year-old engineer and inventor has been awarded. There are dynos, flow benches and high-tech machine tools. And there are whole buildings containing nothing but bikes from Feuling’s extensive collection, some of them extremely rare, almost all of them special. In this surreal setting, which you find yourself wandering around in an incredulous daze, it seems almost normal to come across a trio of big cruisers which are perhaps the strangest and most powerful bikes money can buy. These are the first examples of the Feuling W3, and one thing makes them very different to the average V-twin cruiser – the extra cylinder jutting out up front. Even for Feuling, this seems improbable. Surely you can’t just graft another pot on to a big-bore V-twin engine? But proof that this isn’t a joke comes in the shape of a dyno chart showing the 2.5-litre W3’s peak rear-wheel output of 156bhp and a torque figure of 175ftlb. The nearly finished black W3 on one workbench is production machine No1, currently being readied for actor Larry Hagman, better known as JR Ewing. The W3 project began in collaboration with Harley-Davidson, one of the many large firms for which Feuling has done R&D work. Originally it was intended to fit into Harley’s line-up and contained only a handful of pieces which didn’t have H-D part numbers. But Milwaukee bosses went cool on the project, so Feuling redesigned the engine so the triple could be manufactured under his own name. The rest of the bike is fairly conventional, with a custom-made, Harley FXR-style tubular steel frame that mounts the engine solidly at the rear and via rubber mounts up front. The gracefully curved alloy tank was hand-made by Rob North, the legendary former Triumph triple frame builder. 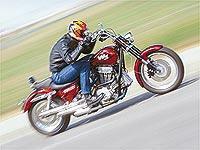 When the big triple fires up, it sounds less distinctive than you’d expect – like a free-breathing Harley twin with the extra cylinder giving a slightly harsher, more urgent note. There’s perhaps just a hint of Ducati-style 90° V in there somewhere, but this is no sports bike. The W3 feels every bit the long, low cruiser as I head off through the outskirts of Ventura, arms reaching up to the pulled-back bars, conscious of the bike’s length and weight and even more so of its truck-like wheelbase. Surprisingly considering its dimensions would embarrass an oil tanker, the W3 is pretty easy to ride. The motor is well-behaved at low revs, idling reliably and responding instantaneously to a gentle tweak of the throttle with strong, but controllable power. If I didn’t know what was between my shins, I’d guess I was perhaps riding a tuned and lengthened Harley custom with a particularly smooth and sweet-running engine. I soon discover it’s a false sense of security, though. The first time I open the throttle properly for the first time, I nearly get blown off the back. In the lower gears the Feuling accelerates with shoulder-splitting force, spinning that fat rear Avon radial with its sheer brute torque, and threatening to lift the front wheel too despite the bike’s length. This version kicks out huge amounts of torque everywhere from two grand to the limiter at 5500rpm, and it doesn’t let you forget it. Finding somewhere to get a bike like this up to speed in the vicinity of Ventura isn’t easy, but eventually the freeway traffic drops away and I have a section of clear, straight road ahead. I yank the throttle at about 50mph in top and the W3 shoots forward, bellowing mightily as it charges through the 100mph mark. The handlebars are flapping slightly at this point – but that could well be due to the forces being put through them by my white-knuckle grip. With traffic up ahead and closing very fast I have no time to look down at the speedo, but the W3 must be doing well over 120mph when I finally have to slow. At that speed it has just been starting to suffer from a slight high-rev misfire, which Feuling later traces to the ignition system. With that sorted, this bike is geared to hit its rev-limiter in fifth at 145mph, but has enough power and torque for maybe 40mph more than that – if it wasn’t for the barn-door aerodynamics. Feuling is working on a new six-speed gearbox that will allow a much higher top speed (without too-wide lower ratios) and will also reduce the wheelbase. That would give a welcome boost to the handling, which is reliable but ponderous, as you might expect from a bike with this blend of high-quality chassis parts and oversized dimensions. Suspension is pretty good at both ends, and straight-line stability below about 100mph is fine. The W3 even behaves pretty well in corners, though it twitches slightly at times, its combination of narrow front and wide rear tyre being one possible culprit. Good marks for powerful triple disc brakes, plus ground clearance no worse than that of plenty of more ordinary cruisers. More ordinary cruisers, did I say? Just about every bike is more ordinary than the W3, but this is no cruiser, despite its look and laid-back riding position. It’s a blaster – an outrageously powerful, brilliantly engineered machine that looks like nothing on earth, accelerates like a Top Fuel drag bike and can be yours, ready to roll, for US $40,000 or roughly £27,500 of your English pounds. Feuling expects to make between 50 and 100 engines this year, most of which will be built into complete motorcycles, but some of which will be sold as part of a W3 engine and chassis kit, for around £13,000. If you’re into horsepower and speed, it’s quite a prospect.